Apparently a block away, Mrs. Homegrown has also been having bean cravings. Maybe there is something in the air. Maybe its just that beans are hearty, filling, inexpensive and all around awesome. I happened to get my hands on a bag of dried scarlet runner beans from Rancho Gordo specialty beans. Scarlet runners are a favorite garden bean as they are great climbers and produce beautiful red flowers. If you want to grow a bean teepee or need to cover a chain link fence, they would be a good plant choice. In fact, my neighbors, Mr. and Mrs. Homegrown, grow them every summer. I’ve never had scarlet runners as a dried bean before. But having lived in co-ops in Berkeley for many years, I am pretty experienced at cooking dried beans, other legumes and whole grains. When it comes to dried beans I almost always do the overnight soak method. To soak beans overnight, simply place your beans in a large pot. Rinse them and pick out any stones or broken beans. Fill the pot up 3/4 of the way with water and let soak overnight or for at least five hours. After their soak you may need to add more water. The beans can soak up a lot. Then cook on medium to high heat for about an hour. 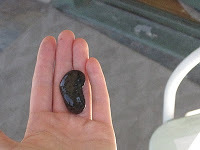 Test a bean. How done you want your beans is rather subjective. If you want to use them in a salad, you may want them a little more firm. But if you want to make refried beans, they need to be extra soft. Just taste and see what you think. I like my beans nice and soft but not falling apart. So to cook the scarlet runner beans I placed them in the 3 quart enameled pot that goes with my solar cooker, filled it the rest of the way with water and let the beans soak overnight. The next day I admired the fat, swollen beans. I threw in a few bay leaves and put the pot in the solar cooker around 9 a.m.. I arrived home around 4 p.m. and my beans were done. They are big and meaty, but still rather bland. 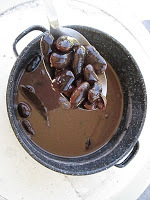 I’m going to eat them for dinner tonight and this is what I’m going to do to flavor them: I’ll keep the pot liquor (the water the beans cooked in). In a separate skillet I’ll heat some oil and saute onions, garlic, maybe a few pieces of celery then add some mushrooms. I really recommend cooking the onions and mushrooms in butter for extra flavor. But since I’m making tonight’s dish vegan, I’m going to cook them in coconut oil. Then I’ll add the cooked onions and mushrooms to the beans on low heat. Then add 1 -2 teaspoons of ground cumin and a dash of cayenne.Yum. StoveTec’s wood burning rocket stove on the left, charcoal and wood on the right. A reader comment alerted me to a very cool product, the StoveTec Rocket Stove, offered by the “not-just-for-profit” wing of the Aprovecho Research Center. Profits from sales of the stoves benefit the Center’s research. 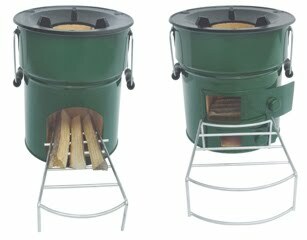 StoveTec sells two rocket stoves, one for wood and the other for both wood and charcoal. While I haven’t tested one, the $37 to $40 price is a bargain. Looks like they could find a nice home in North American as well. Do some pruning and then cook dinner. How about a rocket stove tailgate party? Like many of you, I suspect, we’ve got a few too many tomatoes at this time of the year. One of our favorite ways to preserve our modest harvest is with our solar dehydrator. There’s nothing like the taste of sun dried tomatoes, but unless you live in a very dry desert climate like Phoenix, Arizona you can’t just set fruit out in the sun and expect it to do anything but go moldy. In most places in the world, including here in Los Angeles, the relative humidity is too high to dry things out in the sun. Solar dehydrators work by increasing air flow to dry out the food. The one we built uses a clever strategy to get air moving without the use of electric fans such as you’d find in your typical store bought electric dehydrator. Our solar dehydrator is constructed out of plywood and consists of a heat collector containing a black metal screen housed in a box with a clear plastic top. This screen heats up on a sunny day and feeds hot air into a wooden box above it. Vents at the bottom and the top of the contraption create an upward airflow through natural convection (hot air rises). You put the food on screen covered trays in the upper box. With sliced tomatoes it takes about two full days of drying and you have to take the food indoors at night to prevent mold from growing (a minor inconvenience). 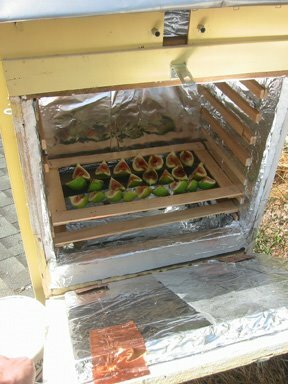 We built our dehydrator several years ago and have used it each season for tomatoes, figs and for making dried zucchini chips. You can find plans for this “Appalachian Dehydrator”, designed by Appalachian State University’s Appropriate Technology Program, in the February/March 1997 issue of Home Power Magazine. The February/March 1999 issue of Home Power features a refinement of this plan, but we just built the original design and it works fine. The original plans and improvements to those plans are split between two articles: Issue #57 and Issue #69. You need to download and read through both before building this dehydrator. . Alternatively, the always excellent Build it Solar website has a whole bunch of solar dehydrator designs, including a nice cardboard version. And while you’re in the library there’s also a book by Eben Fodor, The Solar Food Dryer. As an added bonus to the tinkerers out there, take almost any of these designs, remove the top box, stick it in a window and you’ve got a passive solar room heater. 1. 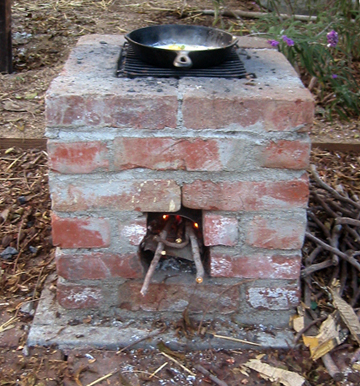 Rocket Stoves: our brick rocket stove and a link to a video on how to make a simple metal version. 2. 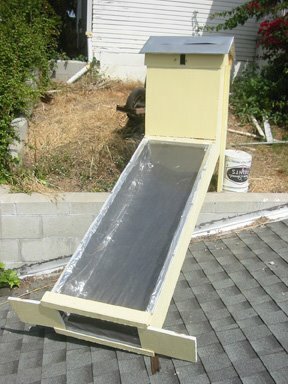 The glorious Solar Cooking Archive which has links to dozens of simple solar cooker plans that you can build yourself. We built our cardboard and aluminum foil Pavarti cooker with plans from the solar cooking archive.